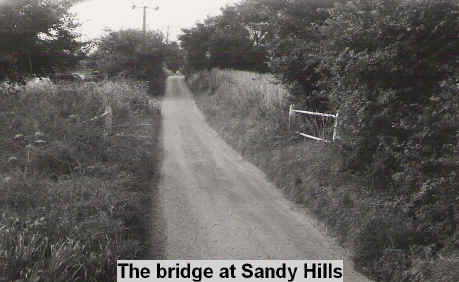 "About h alfway along a narrow twisting lane called Mill Road is a part known locally as Sandy Hills, with a tiny bridge over a stream at the lowest point between the two hills [TM374784.] It is this area where the ghostly hound Black Shuck, sometimes called the Shaggy Dog, is supposed to roam on dark nights, bringing misfortune to all who see him." Source: Patricia Willis: 'The Wraiths of Wissett', in the 'East Anglian Magazine' Vol. 41, No. 9 (July 1982), p. 392. (2) Diana Fernando & Helen Flaxman (ed. ): 'A Walk Through Wissett' (Red Bird Publishing Ltd, 2001), p.11.